Our trainees were back into their normal morning routine, with their early morning swim at 0700 – Luci was the first in the water today. Then it was straight into our duties and breakfast before hoisting anchor and setting off on today’s passage. After we hoisted anchor, we had another line handling lesson and practised raising the sails ready for our passage North. Rangi took the helm to stee our way out of Whangaruru, our shelter for last night. Next up was a knot tying lesson, with Toby, Josh, Jess and Abby doing really well. Jordan then took the helm to our next anchorage at Te Aroa Bay where we anchored up for the afternoon. Kaya and Luci went snorkelling and crayfish gathering with Wayne and Eloise, while everyone else went on the beach and played ball games and explored the rocks. 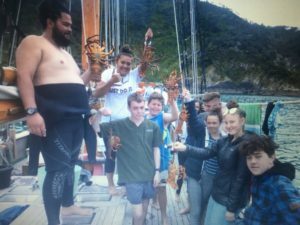 Our hunter gathering team managed to get everyone a mean feed of crayfish and Kina which they brought back on board for our evening enjoyment. Next, we hoisted the anchor and left for our final passage to make our way around Cape Brett. On the way, Rosa learnt about splicing, and Jordan was on the helm. With calm seas it was an easy run back to the Bay and into our anchorage for the evening at Cable Bay, Urupukapuka. Jacob and Luci swam ashore, and the rest joined them for some games on shore. After that we had our 30 mins of silence to reflect on the day’s activities and what everyone had learned and experiences. Then it was back on ship and Josh, Kaya, Maya and Tony completed the tucker challenge, earning their anklet.Dinner was a real feast, with our spaghetti bolognese enhanced with crayfish as well. We are now doing dishes, feeling sleepy and thinking about bed.